I love the ease of use of this system. And the fact that you don’t NEED a ton of STUFF to do it. All you actually need are the cards, your photos, an album and some pocket pages/ page protectors. All of which you can buy through my online store! 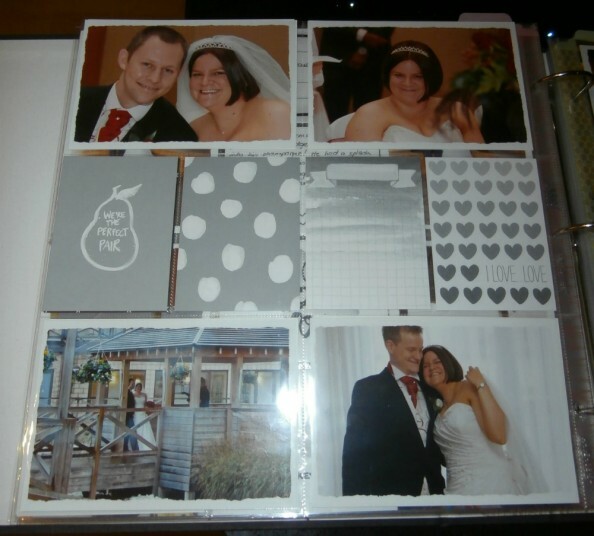 Okay, so I actually do have quite a bit of Project Life kit now (both Stampin’ Up! and non-Stampin’ Up! ), but that’s mainly because I have something of an addictive personality, and also I’m quite indecisive and can’t necessarily choose which option to go for – so I’ll have the lot!! But this is actually a good thing for you guys – because if you come to my Open House, then you can have a look at all of the kits – including the brand new kit “Let’s Get Away”. Check out the Deep Blue Crafting Facebook page for more info (and to get news on my latest blog posts!). 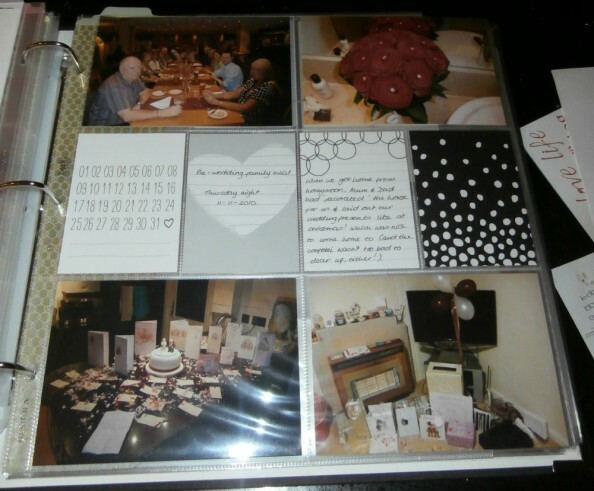 I will also have my scrapbooks available for you to see the products “in action” – including my works in progress! If this is something that interests you, then we can discuss how I use the system, and also other approaches that may work for you. 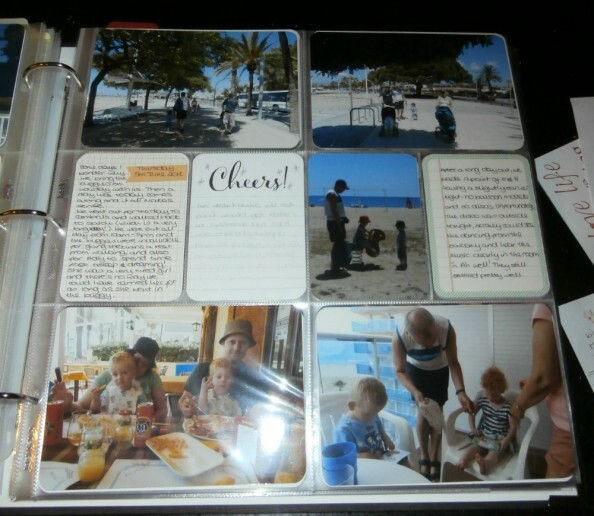 Here are some pages I have done using Project Life – not all of them use Stampin’ Up! supplies, but they are all Project Life products. This page uses the Stampin’ Up! Love Story card kit. Again, this is Love Story. These cards are “standard” Project Life, not from the Stampin’ Up! range. “Standard” cards come with rounded corners as standard (!) but the Stampin’ Up! cards are all square corners. We also have the PL corner rounder punch so you can round them yourself if you prefer that look, but the square corners gives you the option not to. This means you can literally get your photos from the printer, pop them in the pockets, write the cards and pop those in the pockets, and have a cohesive look with minimal effort! Personally, I tend to round the corners of my cards and photos because I love that look, but it’s all a matter of personal preference and choice. If you check out the Stampin’ Up! You Tube channel there are loads of little short videos about Project Life, including videos about the different individual kits which have a VERY quick run through of the cards included in the kit. So I’d recommend having a look at those, too. And if you’re more of a computer crafter then don’t forget about MDS, aka My Digital Studio, which is the crafting software from Stampin’ Up! This weekend I *finally* got mine installed properly, so I am just starting out with it, and trying to get my head around how it works. I have another demonstrator locally who has promised me a bit of a tutorial, so I will have to get in touch with her and get that set up now I know my software is working! Once I’m up to speed, I’d be happy to help you out, too. All the main Project Life kits are available digitally, and also (I believe) come with a pdf file containing all the cards ready to print. Again, give me a shout if you have any questions about this. Okay, I think that’s enough rambling from me, but if you would like to see my books in person, including my now-completed Hello December album, then do pop along on Saturday between 10am and 1pm. If you want to be assured the chance to do the FREE make and take project, then do be sure to “book” your place with me before then. Otherwise, I cannot guarantee that I will have prepared enough packs for people who just pop in. Have a great day! Oh, one last thing, go and check out the new Weekly Deals [Edit: Link not available] which launched this morning! Click each resource link to see other entries that reference it. Stamp Sets: Project Life Point & Click, Remember This (Project Life). Punch: Project Life Corner Rounder. Colours: Basic Black, Whisper White.